With our school hall at Hevingham and servery at Marsham, we are able to offer our children a variety of hot meals that are brought to the school through Edwards & Blake catering company. It is also possible to buy a ‘packed lunch style’ meal. We are continually striving to ensure these are of high quality. Information leaflets about the menus planned for each term are provided in advance. The price of a school meal is @ £2.20 per day (KS1 see below). During meals children are expected to be polite and talk calmly. We expect and encourage children to use a knife and fork for cooked meals and to have good table manners. From September 2014 all children in Reception, Year 1 and Year 2 in state-funded schools in England will receive free school meals. The government made this decision after a recommendation in the School Food Plan. It has been shown in pilot studies to have significant benefits for individual children and for the broader life of the school. Pupils were found to eat more healthily and perform better academically. Schools also reported improved behaviour. We will be offering a hot meal which will be a meat or a vegetarian option and jacket potatoes with a choice of filling. A packed lunch will not be an option. We are expecting to have lots more children wanting school meals due to this new scheme so we will need meal orders in on a Monday for the whole week so our caterers are able to order the correct amount of food. 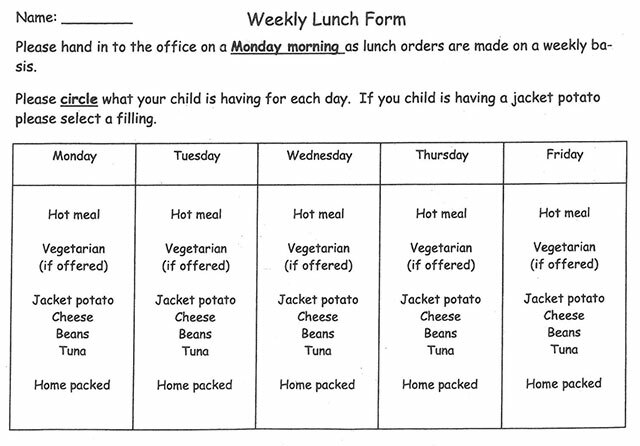 We will have a meal order form so you can hand that in to the office on a Monday with your child’s meal choices for the week. If you child has specific dietary requirements we will need to know what they would like for the following week by Friday morning. If you have any questions please come to the office.